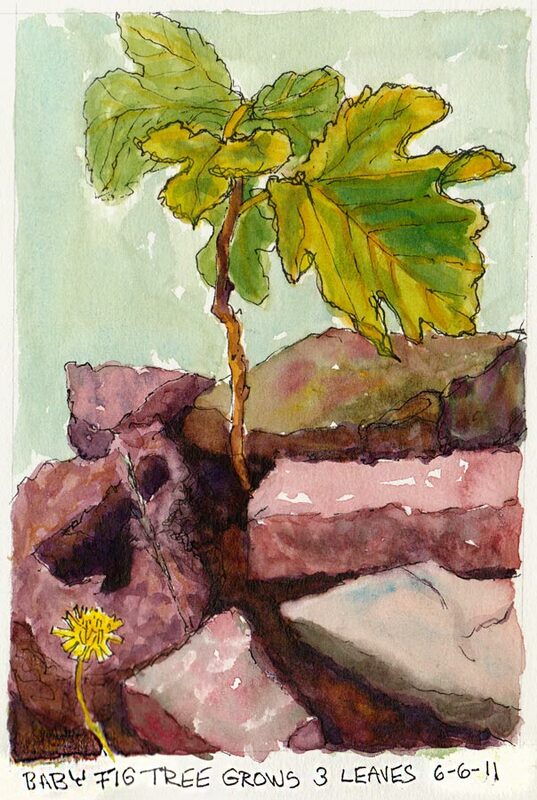 Baby Fig Tree Grows Three Leaves, ink & watercolor, 7x5"
You might remember seeing my previous sketch of my baby fig tree here when it was just a little stick. Now it has three leaves. Yay! It was fun to sit on the sidewalk in front of my house and sketch (except for the occasional ant that tried to annoy me). That reminded me of being a little kid sitting on the sidewalk playing jacks for hours. I used to be pretty good at it. I wonder if anyone still plays jacks and if they’re still made out of metal. I love this drawing! And the sweet dandelion wanting attention, too! I used to play jacks when I was little — don’t see that game around anymore. I love this! Great association to childhood, when you also got to play for unlimited time doing something you loved….. Wonderful color, texture and drawing. Very nice!